Walter Ray Allen was born on 20th of July 1975.He currently plays for Boston Celtics as a shooting guard.Ray Allen has been drafted by Minnesota Timber-wolves with the fifth pick from the university of Connecticut in 1996.He had played three different NBA teams such as Milwaukee Bucks ,Seattle Supersonics and the Boston Celtics. Though Allen was firstly drafted by Minnesota Timber-wolves,He was immediately traded to Milwaukee Bucks.Allen had played for 7 years between 1996-2003 for Milwaukee Bucks.His most successful accomplishment is that he had won NBA All-star three point shoot-out in 2000-2001 season. At Seattle,Ray had became a Superstar by his amazing performances. After he had been traded to Boston Celtics on 28th of June 2007,Ray become one of the Celtics Big Three including Kevin Garnett,Paul Pierce and himself.At Boston Celtics Ray Allen also achieved many individual accomplishments. -on 17th of June 2008,Ray Allen has made seven three-point field goals against Los Angelos Lakers.He also broke the record for three-pointers made in a NBA Finals series with 22, elapsing the previous record of 17 by Dan MajerleDerek Harper. 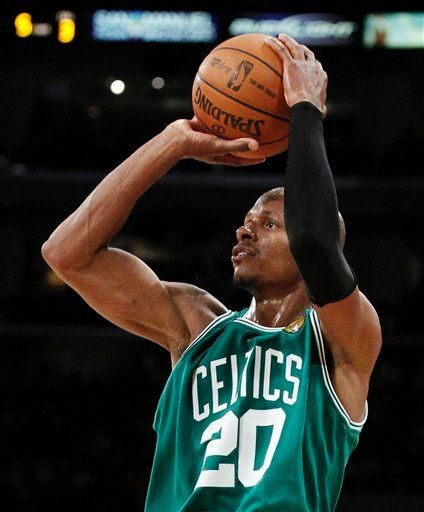 -on 22th of February ,Making 72 consecutive free throws,Ray Allen broke Boston Celtics franchise record in consecutive free throws which was made previously by Larry Bird (71). -On December 10, 2009, Allen scored 18 points to reach the 20,000 point total for his career. -On 6th of June 2010,Allen set the record for most three-pointers made in an NBA Finals game by making 8three-point field goals during the NBA finals game 2 versus Los Angelos Lakers. -During a game against the Los Angeles Lakers on 10th of February , 2011, Allen became the all-time NBA leader in total 3-point field goals made (2,561), passing Reggie Miller's record of 2,560. - In the 2010-11 season Allen was named to his tenth All-Star game. In 1998, Allen co-starred film He Got Game as high school basketball phenomenon Jesus Shuttles worth. His role as Shuttlesworth earned him the nickname "Jesus" from teammates and fans. Allen also appeared as Marcus Blake in the 2001 film Harvard Man. The Allen Family consists of Ray, Shannon, Tierra, Walter and Walker. They currently live in Boston, Massachusetts. . Shannon ,who is Ray's wife ,gave birth to her and Ray's children Tierra(daughter), Walter(son), and Walker Allen(son). Flo Allen too,who is Allen' s mother.